Industrial hemp farmers are looking for ways to dry their crops efficiently without paying a fortune for large dryers. The tobacco market took a blow this year loosing almost half of its contracted acres. This may be beneficial to industrial hemp farmers across the US. Traditional flue cured tobacco barns have been used for generations to dry and cure tobacco. Each barn has a capacity of up to 15,000 lbs of green material and optional heat settings for desired drying times. Drying time varies depending on heat but can get 15,000 lbs of material dried within 48 hours. A used barn can cost as low as $4500 right now due to loss of contracts for flue cured tobacco growers. 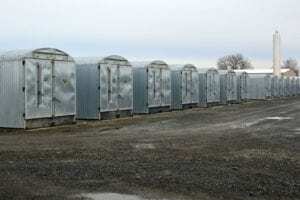 Kentucky hemp farmers have already started purchasing most of the barns at auctions and equipment sales. Call Granville Equipment today on tips of where to find these great deals. Traditional Box Barns used for Drying Hemp found here.